A “twilight” ticket to Disneyland or Disney’s California Adventure redeemable after 4 p.m.
There’s still time to sponsor the Summit! Sponsor the largest one-day transportation event in California. The Summit is the only place where you can mix and mingle with every transportation CEO in Southern California, policy makers and nationally-known transportation experts. Sign up to sponsor one of our 12 breakout sessions, our closing session, WiFi access or our hospitality suite. This month we asked Congressman Gary Miller (R-CA) about his thoughts on the recently passed federal transportation bill and how some of the provisions will impact Southern California. 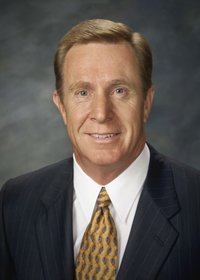 Mobility 21 applauds Rep. Miller for his tireless work to expedite project delivery through the Breaking Down Barriers initiative and for working with Congress to pass a bill before the June 30 deadline. Mobility 21: With the recent passage of the federal transportation bill just before the June 30 deadline, what’s your overall opinion of the bill? Rep. Miller: While the process wasn’t pretty, I’m pleased that Congress was able to pass this bipartisan highway bill after nine extensions. Though I preferred a longer reauthorization, this bill gives states and local governments far more certainty as they plan for transportation and critical infrastructure improvements. I’m thrilled that the final bill includes several of my provisions that will reform the environmental review process in a way that speeds up the delivery of highway projects and reduces construction costs without compromising our nation’s environmental protections. The bill also exempts smaller projects from burdensome and unnecessary reviews, consolidates or eliminates numerous federal bureaucracies and gives states greater flexibility in allocating resources toward surface transportation projects they deem worthy. At a time when Washington is bogged down with presidential-year politics, I am glad that Congress was able to come together to pass this vital reauthorization measure to improve our roads, cut costs and promote economic growth. Mobility 21: Which of the reform measures that made it into the final bill do you think will have the most significant impact on future project delivery? Rep. Miller: Of all the reforms included in MAP-21, I think making the pilot program that allows states to take on the responsibility of complying with NEPA requirements for highway projects permanent and expanding participation to all states will have a tremendous impact on project delivery. I was proud to author the language establishing this program under SAFETEA-LU, which shaved 17 months off of the environmental review process and 30 months off of overall project delivery in California. This program has benefited Californians by reducing project costs while retaining the integrity of current environmental protections, and I am pleased that all states will now have the opportunity to participate in this important streamlining program. Mobility 21: With the inclusion of America Fast Forward in the bill to provide low-cost financing options to credit-worthy buyers, what are some specific ways counties in Southern California will benefit? Rep. Miller: Southern California is full of self-help counties that are able to utilize local resources to match federal dollars they receive for transportation projects. The Transportation Infrastructure Finance and Innovation Act (TIFIA) program provides federal credit assistance in the form of direct loans, loan guarantees, and standby lines of credit to finance surface transportation projects of national and regional significance. The America Fast Forward initiative will benefit the region’s credit-worthy counties by increasing the amount of TIFIA dollars available from $122 million this year to $750 million in fiscal year 2013 to $1 billion in fiscal year 2014. I am pleased that the highway reauthorization includes this initiative that will expand the options available to our region for financing transportation improvements. Mobility 21: The bill provides for short-term relief for the Highway Trust Fund balance, but projections show that the fund will be in the red again in two years. How do you think Congress will address this funding shortfall problem in the long term? Rep. Miller: Ensuring the long-term solvency of the Highway Trust Fund remains a top priority. That will continue to be a challenge. This reauthorization now gives Congress another two years to study all possible solutions to ensure that the Fund is able to function and provide the resources our nation needs to improve our aging transportation infrastructure, which is vital to our future economic growth. As a senior member of the House Transportation and Infrastructure Committee, I will closely study these alternatives to make sure that whatever solution we come up with achieves this goal. The demolition and reconstruction of the Mulholland Bridge is required to widen the freeway as part of the I-405 Sepulveda Pass Improvements Project. The second 10-mile closure of both directions of the San Diego Freeway (I-405) over the Sepulveda Pass is scheduled for Sept. 29-30. Dubbed “Carmageddon,” the half a million motorists who typically drive this portion of the I-405 every weekend are encouraged to avoid the area during the closure. The Los Angeles County Metropolitan Transportation Authority (Metro), Caltrans and Metrolink, together with local police and fire authorities, have launched an extensive outreach campaign to give motorists advance notice of the closure and encourage alternative travel options. 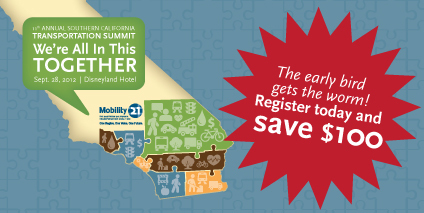 With closures beginning as early as 7 p.m. Friday, Sept. 28, the date of the annual Mobility 21 Summit, we encourage all Mobility 21 conference attendees to avoid the closure area in Los Angeles County by spending the weekend at the Disneyland Resort in Anaheim immediately following the Summit. Discount hotel rates and Disneyland tickets are available! The I-405 Sepulveda Pass Improvements Project, which is currently the largest budget design-build highway project in Southern California, will add a 10-mile HOV lane and improve supporting infrastructure such as ramps, bridges and sound walls on the I-405, while widening lanes from the Santa Monica Freeway (I-10) to the Ventura Freeway (US-101). With the June 30 deadline to pass the nation’s next surface transportation program looming large, Congress passed a two-year transportation bill on June 29 to provide $105.2 billion for critical infrastructure projects throughout the country. Members of Mobility 21 applaud Senate Environment and Public Works Chair Barbara Boxer (D-CA), House Transportation and Infrastructure Chair John Mica (R-FL) and members of the California delegation for their leadership in delivering a transportation bill that gives Southern California and the rest of the nation much-needed certainty to plan long-term, job-creating transportation projects. Click here to see how Mobility 21’s transportation priorities fared in the final bill. The final bill, Moving Ahead for Progress in the 21st Century (MAP-21), includes provisions Mobility 21 has staunchly supported — the America Fast Forward and Breaking Down Barriers initiatives. America Fast Forward, which provides low-cost financing options for qualified, credit-worthy projects, is a flexible program that enhances and expands the Transportation Infrastructure Finance and Innovation Act loan program and creates Qualified Transportation Improvement Bonds to accelerate project delivery and the creation of jobs. Breaking Down Barriers improves the federal regulation environment and provides oversight without slowing projects down and enables efficient use of taxpayer dollars. While MAP-21 includes provisions for a national and state freight policy and maintains the Projects of National and Regional Significance program, members of Mobility 21 are disappointed to see $2 billion in freight funding that was included in the Senate bill dropped from the final legislation. Mayor of Los Angeles Antonio Villaraigosa is joined by Senator Darrell Steinberg, Metro CEO and Mobility 21 Board Member Art Leahy, California High-Speed Rail Authority Chair Dan Richard and Governor Jerry Brown for a bill-signing to fund the first segment of high-speed rail in California and commuter rail improvements throughout the state. Earlier this month, the legislature approved and the governor signed Senate Bill 1029 (SB 1029) to appropriate $4.7 billion for construction on the first 130-mile stretch of high-speed rail and to provide funding for commuter rail improvements statewide. With the passage of the bill, California will receive $7.9 billion in federal matching funds. 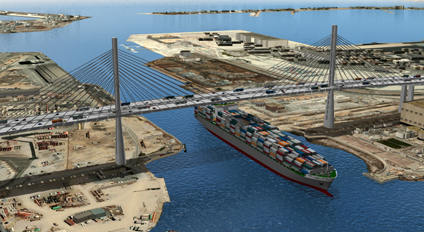 A 200-foot clearance will permit larger, greener ships to pass under the Gerald Desmond Bridge replacement. The Long Beach Board of Harbor Commissioners recently approved a $649.5 million contract to replace the aging Gerald Desmond Bridge to Shimmick Construction Co., FCC Construction SA and Impregilo SpA. The joint venture also includes subcontractors Arup North America Ltd. and Biggs Cardosa Associates Inc.
Mobility 21 has strongly supported the replacement project as the Gerald Desmond Bridge is a vital link in the nation’s trade system and a major commuter corridor. But the bridge, built in the 1960s, was not designed to handle today’s traffic volumes and is deteriorating. The replacement project will ensure the safety of commuters and truck drivers and protect Southern California’s important role as a major trading hub. Construction of the new bridge is expected to take about four years and generate, on average, 4,000 jobs per year. Construction is expected to begin in 2013 and the total cost of the overall bridge replacement project is estimated at about $1 billion, including site preparation, demolition and other considerations. Metro CEO and Mobility 21 Board Member Art Leahy celebrates the opening of the Metro ExpressLanes Customer Service Center and announces the availability of FasTrak® transponders. With Metro ExpressLanes along the Harbor Freeway (I-110) poised to open this fall and Metro ExpressLanes along the San Bernardino Freeway opening in early 2013, Metro and Caltrans officials on July 25 announced the opening of the Metro ExpressLanes Customer Walk-In Center in Gardena, where the public can open a FasTrak® account and receive a FasTrak® transponder to enable them to enter the Metro ExpressLanes. Metro, in partnership with Caltrans, is embarking on a one-year demonstration program that will convert 11 miles of existing carpool lanes on the I-110 between the Harbor Gateway Transit Center/182nd Street and Adams Boulevard near downtown Los Angeles and 14 miles on the I-10 (El Monte Busway) between Union Station/Alameda Street and the I-605 Freeway to express toll lanes. The ExpressLanes program seeks to reduce congestion by improving travel choices in the two corridors. Solo drivers, currently not allowed to use the carpool lanes, will be allowed to use the lanes for a toll. Carpools, transit, vanpools, privately operated buses and motorcycles will travel toll free. Net toll revenues will be reinvested in the corridor where they are generated for transportation improvements. HDR delivered the SR-520 Floating Bridge Replacement and the High-Occupancy Vehicle General Engineering Consultant contract and received Washington State Department of Transportation’s Golden Pontoon Award for innovative project solutions. Photography by Vince Streano. HDR is a proud partner of Mobility 21, which gives us all a bigger voice in advocating regional transportation solutions. To that end, HDR works collaboratively with clients to increase capacity, enhance mobility and improve safety and security throughout Southern California. HDR’s highway, rail and transit planners, engineers and architects handle all aspects of a project, from financial analysis, urban design, environmental analysis, design and program and construction management. As a company and as individuals, HDR has secured numerous awards for program management contracts. The procurement process for SH-130 won first place for studies, research and engineering services from the Texas Council of Engineering Companies, with Ken Smith as deputy project manager. 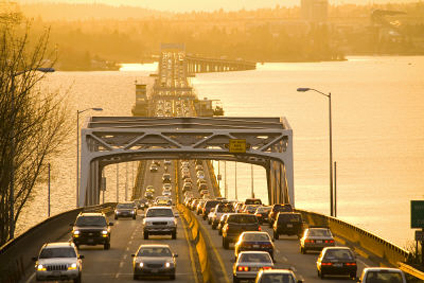 Smith also received the Washington State Department of Transportation’s Golden Pontoon award for his work on the SR-520 Floating Bridge Replacement and the High-Occupancy Vehicle General Engineering Consultant contract. He participated in procurement for the floating bridge and landings design-build contract, and as a design review board advisor for the pontoon design-build contract. Smith, a senior mega-project manager, is an expert in alternative delivery methods, including design-build, construction manager at risk and public-private partnerships. HDR’s already strong program management resume was recently buoyed with the acquisition of InfraConsult LLC, an infrastructure management and advisory firm with a robust California presence. “InfraConsult provides outstanding program and financial management advisory services, and is supporting clients on some of the world’s most complex transportation and transit projects,” said Eric Keen, HDR Engineering, Inc., President. HDR is a global employee-owned firm providing architecture, engineering, consulting, construction and related services through its various operating companies. HDR’s more than 8,000 professionals are committed to helping clients manage complex projects and make sound decisions. From Oct. 14-17 in Los Angeles, Rail~Volution will offer Southern Californians dedicated to transit, livability and healthy communities the opportunity to gather and discuss ways to weave a fully integrated, efficiently operated transit network capable of meeting the future needs of the region’s constantly evolving demographic. 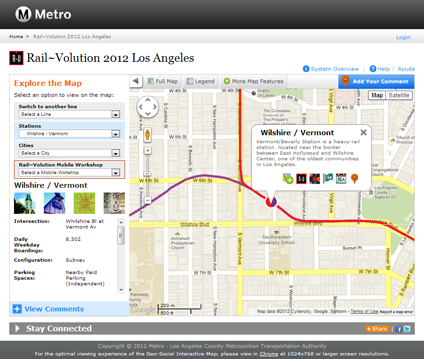 This year, for the first time, Rail~Volution 2012 will introduce its new “Geo-Social” Interactive Map. Will you be attending Rail~Volution this year? Take your conference experience to the next level with the new “Geo-Social” Interactive Map created by Arellano Associates and Civic Resource Group. A location-based social networking tool that will allow conference guests to learn about Metro’s operational rail and bus rapid transit systems. Use the mobile app to access information about stations, cities, mobile workshops and local destinations and share your comments and mobile workshop experiences with other conference participants via Facebook and Twitter. Start exploring now and make this year’s Rail~Volution conference a truly interactive experience. Stay tuned … the mobile app will be available soon! Contact Marnie O’Brien Primmer for more information.